American statesman and orator, was born in Hanover county, Virginia, on the 12th of April 1777, and died in Washington on the 29th of June 1852. Few public characters in the United States have been the subject of more heated controversy. His enemies denounced him as a pretender, a selfish intriguer, and an abandoned profligate; his supporters placed him among the sages and sometimes even among the saints. He was an arranger of measures and leader of political forces, not an originator of ideas and systems. His public life covered nearly half a century, and his name and fame rest entirely upon his own merits. He achieved his success despite serious obstacles. He was tall and awkward, his early instruction scant. But he read books, spoke well, and so, after his admission to the bar at Richmond, Virginia in 1797, and his move the following year to Lexington, Kentucky, he quickly acquired a reputation and a lucrative income from his law practice. Thereafter, until the end of life, and in a field where he met, as either friend or foe, John Quincy Adams, Albert Gallatin, James Madison, James Monroe, Daniel Webster, Andrew Jackson, John C. Calhoun, Randolph and Thomas Hart Benton, his political activity was well nigh ceaseless. At the age of twenty-two (1799), he was elected to a constitutional convention in Kentucky; at twenty-six, to the Kentucky legislature; at twenty-nine, while yet under the age limit of the United States Constitution, he was appointed to an unexpired term (1806-07) in the United States Senate, where, contrary to custom, he at once plunged into business, as though he had been there all his life. He again served in the Kentucky legislature (1808-09), was chosen speaker of its lower house, and achieved distinction by preventing an intense and widespread anti-British feeling from excluding the common law from the Kentucky code. A year later he was elected to another unexpired term in the United States Senate, serving in 1810-11. At thirty-four (1811) he was elected to the United States House of Representatives and chosen speaker on the first day of the session. One of the chief sources of his popularity was his activity in Congress in promoting the war with Great Britain in 1812, while as one of the peace commissioners he reluctantly signed the treaty of Ghent on the 24th of December 1814. During the fourteen years following his first election, he was re-elected five times to the House and to the speakership; retiring for one term (1821-23) to resume his law practice and retrieve his fortunes. He thus served as speaker in 1811-14, in 1815-20 and in 1823-25. Once he was unanimously elected by his constituents, and once nearly defeated for having at the previous session voted to increase congressional salaries. He was a warm friend of the Spanish-American revolutionists (1818) and of the Greek insurgents (1824). From 1825 to 1829 he served as secretary of state in President John Quincy Adams's cabinet, and in 1831 he was elected to the United States Senate, where he served until 1842, and again from 1849 until his death. From the beginning of his career he was in favor of internal improvements as a means of opening up the fertile but inaccessible West, and was opposed to the abuse of official patronage known as the "spoils system." The most important of the national questions with which Clay was associated, however, were the various phases of slavery politics and protection to home industries. The most prominent characteristics of his public life were his predisposition to "compromises" and "pacifications" which generally failed of their object, and his passionate patriotic devotion to the Union. His earliest championship of protection was a resolution introduced by him in the Kentucky legislature (1808) which favored the wearing by its members of home-made clothes; and one in the United States Senate (April 1810), on behalf of home-grown and home-made supplies for the United States Navy, but only to the point of making the nation independent of foreign supply. In 1816 he advocated the Dallas tariff, in which the duties ranged up to 35% on articles of home production, the supply of which could satisfy the home demand; the avowed purpose being to build up certain industries for safety in time of war. In 1824 he advocated high duties to relieve the prevailing distress, which he pictured in a brilliant and effective speech. Although the distress was caused by the reactionary effect of a disordered currency and the inflated prices of the war of 1812, he ascribed it to the country's dependence on foreign supply and foreign markets. Great Britain, he said, was a shining example of the wisdom of a high tariff. No nation ever flourished without one. He closed his principal speech on the subject in the House of Representatives with a glowing appeal in behalf of what he called "The American System." In spite of the opposition of Daniel Webster and other prominent statesmen, Clay succeeded in enacting a tariff which the people of the Southern states denounced as a "tariff of abominations." As it overswelled the revenue, in 1832 he vigorously favored reducing the tariff rates on all articles not competing with American products. His speech in behalf of the measure was for years a protection text-book; but the measure itself reduced the revenue so little and provoked such serious threats of nullification and secession in South Carolina, that, to prevent bloodshed and to forestall a free trade measure from the next Congress, Clay brought forward in 1833 a compromise gradually reducing the tariff rates to an average of 20%. To the Protectionists this was "like a crash of thunder in winter"; but it was received with such favor by the country generally, that its author was hailed as "The Great Pacificator," as he had been thirteen years before at the time of the Missouri Compromise (see below). As, however, the discontent with the tariff in the South was only a symptom of the real trouble there -- the sensitiveness of the slave-power, -- Clay subsequently confessed his serious doubts of the policy of his interference. He was only twenty-two, when, as an opponent of slavery, he vainly urged an emancipation clause for the new constitution of Kentucky, and he never ceased regretting that its failure put his state, in improvements and progress, behind its free neighours. In 1820 he congratulated the new South American republics on having abolished slavery, but the same year the threats of the Southern states to destroy the Union led him to advocate the "Missouri Compromise", which, while keeping slavery out of all the rest of the territory acquired by the Louisiana Purchase north of Missouri's southern boundary line, permitted it in that state. Then, greeted with the title "The Great Pacificator" as a reward for his success, he retired temporarily to private life, with a larger stock of popularity than he had ever had before. Although at various times he had helped to strengthen the law for the recovery of fugitive slaves, declining as secretary of state to aid Great Britain in the further suppression of the slave trade, and demanding the return of fugitives from Canada, yet he heartily supported the colonizing of the slaves in Africa, because slavery was the "deepest stain upon the character of the country," opposition to which could not be repressed except by "blowing out the moral lights around," and "eradicating from the human soul the light of reason and the law of liberty." When the slave power became more aggressive, in and after the year 1831, Clay defended he right of petition for the abolition of slavery in the District of Columbia, and opposed Calhoun's bill forbidding the use of the mails to "abolition" newspapers and documents. He was lukewarm toward recognizing the independence of Texas, lest it should aid the increase of slave territory, and generally favored the freedom of speech and press as regards the question of slavery; yet his various concessions and compromises resulted, as he himelf declared, in the abolitionists denouncing him as a slaveholder, and the slaveholders as an abolitionist. In 1839, only twelve months after opposing the pro-slavery demands, he prepared an elaborate speech, in order "to set himself right with the South," which, before its delivery, received pro-slavery approval. While affirming that he was "no friend of slavery" he held abolition and the abolitionists responsible for the hatred, strife, disruption and carnage that menaced the nation. In response, Calhoun extended to him a most hearty welcome, and assigned him to a place on the bench of the penitents. Being a candidate for the presidency Clay had to take the insult without wincing. It was in reference to this speech that he made the oft-quoted remark that he "would rather be right than be president." While a candidate for president in 1844, he opposed in the "Raleigh letter" the annexation of Texas on many grounds except that of its increasing the slave power, thus displeasing both the men of anti-slavery and those of pro-slavery sentiments. In 1847, after the conquest of Mexico, he made a speech against the annexation of that country or the acquiring of any foreign territory for the spread of slavery. 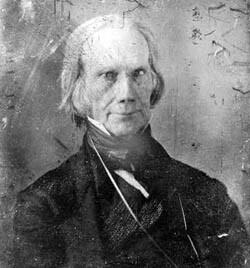 Although in 1849 he again vainly proposed emancipation in Kentucky, he was unanimously elected to the United States Senate, where in 1850 he temporarily pacified both sections of the country by successfully offering, for the sake of the "peace, concord and harmony of these states," a measure or series of measures that became known as the "Compromise of 1850." It admitted California as a free state, organized Utah and New Mexico as territories without reference to slavery, and enacted a more efficient fugitive slave law. In spite of great physical weakness he made several earnest speeches in behalf of these measures to save the Union. Another conspicuous feature of Clay's public career was his absorbing and rightful, but constantly ungratified, ambition to be President of the United States. His name in connection therewith was mentioned comparatively early, and in 1824, with W.H. Crawford, Andrew Jackson, and John Quincy Adams, he was a candidate for that office. There being no choice by the people, and the House of Representatives having elected Adams, Clay was accused by Jackson and his friends of making a corrupt bargain whereby, in payment of his vote and influence for Adams, he was appointed secretary of state. This made Jackson Clay's lifelong enemy, and ever after kept Clay busy explaining and denying the allegation. In 1832 Clay was unanimously nominated for the presidency by the National Republicans; Jackson, by the Democrats. The main issue was the policy of continuing the United States Bank, which in 1811 Clay had opposed, but in 1816 and always subsequently warmly favored. A majority of the voters approved of Jackson's fight against what Clay had once denounced as a dangerous and unconstitutional monopoly. Clay made the mistake of supposing that he could arouse popular enthusiasm for a moneyed corporation in its contest with the great military "hero of New Orleans." In 1839 he was a candidate for the Whig nomination, but by a secret ballot his enemies defeated him in the party convention, held in December of that year, and nominated William Henry Harrison. The result threw Clay into paroxysms of rage, and he violently complained that his friends always used him as their candidate when he was sure to be defeated, and betrayed him when he or any one could have been elected. In 1844 he was nominated by the Whigs against James Knox Polk, the Democratic candidate. By an audacious fraud that represented him as an enemy, and Polk as a friend of protection, Clay lost the vote of Pennsylvania; and he lost the vote of New York by his own letter abating the force of his previous opposition to the annexation of Texas. Even his enemies felt that his defeat by Polk was almost a national calamity. In 1848, Zachary Taylor, a Mexican War hero, and hardly even a convert to the Whig party, defeated Clay for the nomination, Kentucky herself deserting her "favorite son." Clay's quick intelligence and sympathy, and his irreproachable conduct in youth, explain his precocious prominence in public affairs. In his persuasiveness as an orator and his charming personality lay the secret of his power. He had early trained himself in the art of speech-making, in the forest, the field and even the barn, with horse and ox for audience. By contemporaries his voice was declared to be the finest musical instrument that they ever heard. His eloquence was in turn majestic, fierce, playful, insinuating; his gesticulation natural, vivid, large, powerful. In public he was of magnificent bearing, possessing the true oratorical temperament, the nervous exaltation that makes the orator feel and appear a superior being, transfusing his thought, passion and will into the mind and heart of the listener; but his imagination frequently ran away with his understanding, while his imperious temper and ardent combativeness hurried him and his party into disadvantageous positions. The ease, too, with which he outshone men of vastly greater learning lured him from the task of intense and arduous study. His speeches were characterized by skill of statement, ingenious grouping of facts, fervent diction, and ardent patriotism; sometimes by biting sarcasm, but also by superficial research, half-knowledge and an unwillingness to reason a proposition to its logical results. In private, his never-failing courtesy, his agreeable manners and a noble and generous heart for all who needed protection against the powerful or the lawless, endeared him to hosts of friends. His popularity was as great and as inexhaustible among his neighbors as among his fellow-citizens generally. He pronounced upon himself a just judgment when he wrote: "If any one desires to know the leading and paramount object of my public life, the preservation of this Union will furnish him the key." Prior to his founding the Whig Party, a Democrat-Republican.